According to the 1891 Julius Bien atlas, Kissena Creek (also known as Ireland Mill Creek and Mill Creek) originated in a peat marsh known as Gutman’s Swamp, flowing east through Fresh Meadows, then turning north at Utopia Parkway and finally east near Kissena Park Golf Course. The stream widened into a lake in Kissena Park, continuing through Kissena Corridor Park and Queens Botanical Garden towards Flushing Meadows, where it merged with Flushing Creek. By the time that the World’s Fair had arrived in 1939, much of Kissena Creek’s watershed had been covered with streets and housing, reducing its flow to a trickle. Its confluence with Flushing Creek was covered in favor of the fairgrounds, where the Court of Peace was built. In the foreground the Court of Peace was anchored by the U. S. Government exhibit, also known as the Federal Building. In front of it was a decorative lawn flanked by 13 countries and another ten behind these. As an occasional comic book reader, the federal building reminds me of the Justice League’s headquarters, which also appeared in the Super Friends franchise. Recall that Superman was created in 1938, Batman in 1939, and The Flash in 1940. They were contemporaries of this World’s Fair and the architecture of their comic books reflects this style. Beneath this Court of Peace, Kissena Creek used to flow. Separated from the rest of Flushing Meadows-Corona Park by Van Wyck Expressway, the former Court of Peace today contains two big soccer fields and the Al Oerter Recreation Center. Notice the fake grass. That’s because beneath the fields is the Flushing Bay Combined Sewer Outfall (CSO) Retention Facility, a $291 million underground facility completed in 2009. When there is excessive rainfall, the site collects up to 43 millions gallons of raw sewage that is later pumped to the Tallman Island Waste Water Treatment Plant where it is treated and released into the East River. Prior to this plant’s construction, raw sewage flowed directly into Flushing Bay. If you’re curious to see the belly of this beast, you may either apply for a job there, risk a trespassing conviction, or request a tour from the DEP. For now, the contractor’s photo will suffice. That’s the water of Kissena Creek’s watershed running through those pipes. As was the case with Riverbank State Park, when a sewage treatment plant was built, locals were not too thrilled, so the state put a park on it to benefit the community. The same thing happened in Flushing, where the Al Oerter Recreation Center stands atop the underground facility. Its namesake was a four-time Olympic gold medal winner for discus throw. He was born in Queens. I’ve written previously about the Queens Botanical Garden (QBG), and it is helpful that the 1940 aerial survey has such a high resolution. Zooming in on the original site of QBG, we see two other features that I’ve documented: Flushing Creek and Tidal Gate Bridge. Today this site is within the park’s pitch-and-putt golf course. In 1940 the present-day QBG site was undeveloped parkland bound roughly by College Point Boulevard on its west and Main Street on its east. The straight-line embankment running through this site is the abandoned route of the Stewart Line. Officially known as the Central Railroad of Long Island, it was funded by department store magnate Alexander T. Stewart. The line diverged from the Port Washington Branch at Flushing Creek and ran southeast towards Floral Park, where it continued east towards Bethpage and Babylon. The short-lived line operated between 1873 and 1879, its route later re-purposed for Kissena Corridor Park. Kissena Creek is seen meandering along this unused embankment. By the late 1950s, the stream was completely covered using fill from the nearby Long Island Expressway underpass excavations. The QBG relocated to this property in 1963, where it remains to the present day. In this 1909 G. W. Bromley property survey, a grid of paper streets straddles the meandering creek, but at the time this area was on the edge of Flushing, still retaining much of its open landscape. Note the “abandoned R. R.” indicating the old Stewart Line that used to follow the stream. At the corner of rose Avenue and Kissena Boulevard, an entrance into Kissena Park on the exact site of the rail line has a decorative fence that evokes the choo-choos that used to chug here. What if this line wasn’t abandoned? Had it been revived, a huge swath of suburban Queens would have had a one-seat ride to Penn Station: Fresh Meadows, Hollis Hills, among other places. Zooming in on Kissena Corridor Park fropm the 1940 aerial, tract housing is nibbling away at the edges of this floodplain. While the city acquired land along the creek in a piecemeal fashion, one enclave on Kissena Boulevard was completed before the city could act, resulting in three blocks of homes enveloped by parkland on four sides. In the background is Kissena Park with its namesake lake, and the hills of Kissena Park Golf Course. Along with the filling of Kissena Creek, this green corridor was given three playgrounds in the postwar years as population grew in the surrounding neighborhoods. With the exception of the ball fields and playgrounds, changes in the appearance of Kissena Corridor Park were largely conducted by nature as saplings grew into trees. Without intervention, invasive species such as the ailanthus and mugwort spread across the park. In 2001, the Natural Resources Group (NRG) at the Parks Department began its ambitious restoration program for the park, clearing out invasive trees and replacing them with more than 5,000 native species. Some sections of this park have the look of a young forest but one can imagine how thick it will appear in a generation. Prior to my grandfather’s death in 2012, I often walked from my home in Electchester to his apartment on the Sabbath, where I volunteered to lead the services. The most pleasant park of the 40-minute walk was through Kissena Corridor Park, where wood chip trails, paved paths, and walkways provided a shortcut and a momentary departure from the busy streetscape. The scenery reminded me of childhood when I walked through the forests of Latvia and Lithuania with my father and grandfather, to whom Hidden Waters is dedicated. Nature has her way of reclaiming streams. Above, I identified three sizable vernal pools that appear after heavy rain or snowmelt. Kissena Creek used to flow here. On the Colden Street side of Kissena Corridor Park is an allotment garden assigned to local seniors. Such gardens are common in European cities, giving apartment dwellers a small plot of land to grow food. My father had one too. Here in New York, my windowsill is the best that I can do for now. Breaking up the neat grid, 146th Street dead ends into the park. For decades maps showed this street running through the park but this route was never built and eventually zoned into the park. From the park’s southern side one can see my grandfather’s home: the Martin Lande House, run by Selfhelp Community Services, providing independent living for seniors. He lived there for the last 16 years of his life, serving as president of the synagogue in the building’s first floor. These young evergreens will eventually grow into a dense forest. At the corner of Booth Memorial Avenue and Main Street, across from the park is New York-Presbyterian Queens, originally known as Booth Memorial Hospital. My two children were born here, my two grandparents were admitted here before their deaths. We have a long history here. At the onset of the present millennium, the hospital was undergoing an expansion and Parks temporarily granted the hospital permission to use a portion of Kissena Corridor for a parking lot. Local residents grudgingly accepted and then demanded a meditation garden on the site once the parking lot’s lease ended. After a lengthy effort to secure funding and several redesigns, the garden built for patients, staff, and the public is on its way to reality. Credit here goes to the Kissena Corridor Park Conservancy, Rep. Grace Meng, and Councilman Peter Koo. In the 1940s Parks Commissioner Robert Moses envisioned an “emerald necklace” of parks running from Flushing Meadows to Little Neck Bay, connecting with Kissena Park, Cunningham Park and Alley Pond Park. Land was acquired, parks were built, but not the continuous path running through this corridor. Bike lanes ran through parks in some places, and on bordering streets in other places. In 1988, the connected parks of eastern Queens were included in the Brooklyn-Queens Greenway, a 40-mile continuous pedestrian and bike route running from Coney Island to Fort Totten. Along the way it covers 13 parks, two botanical gardens, the New York Aquarium, two borough art museums, the New York Hall of Science, two environmental education centers, four lakes, and numerous ethnic and historic neighborhoods. When possible, the route stays within a park, or along a dedicated road such as Ocean Parkway, or Vanderbilt Motor Parkway. Unfortunately at Kissena Corridor, it was forced to run on streets along the park’s periphery before entering Kissena Park. In 1988, The Kissena Walk proposal sought to address this deficiency as part of a grand redesign for Kissena Corridor Park. To say that this plan was grand is an understatement as it also included daylighting Kissena Creek within the park. Daylighting! Nothing excites an urban stream historian more than seeing an underground waterway brought back to the surface. Why didn’t this plan become reality? I don’t know, but everyone knows that Parks didn’t receive a decent slice of the budget pie until the new millennium. In those days the city didn’t have so much money for grandiose park reconstructions. There is a movement to make The Kissena Way a reality as part of the Eastern Queens Greenway, running the bike path inside the park from Flushing Meadows through Kissena Park. Searching through Municipal Archives, I found a 1934 photo of Kissena Creek flowing through Kissena Park with the culvert under construction that would eventually carry the creek underground. The second archival photo shows the culvert under construction at Rose Avenue and Kissena Boulevard. This marshland was filled and flattened in favor of ball fields. Will Kissena Creek ever see daylight again? As is the case with Flushing Meadows, where a 2008 daylighting proposal would have meant eliminating two soccer fields, a park is a democracy with many interest groups. For Kissena Corridor Park, creating a paved bike path could detract from the naturalistic mulch paths favored by some users. Restoring the stream could mean removal of trees and a couple of ball fields along its proposed route. That’s why something as nice as a meditation garden or a comfort station at Rachel Carson Playground took so long to approve- the costs, the space, the design… nothing is simple when it comes to the development of parks. The section of Kissena Corridor Park that is documented here is formally known as Kissena Corridor Park West. The eastern corridor that connects Kissena Park and Cunnningham Park was given a detail profile in 2012 by Kevin Walsh on Forgotten-NY. The former source of this stream was Gutman’s Swamp, and I’ve been there. In Fresh Meadows, I visited the site of a pond that also fed into this stream. Further downstream, I documented a pumping station and former reservoir on the creek. I then traveled with my daughter to Kissena Lake, the only part of this stream that still appears above the surface. Finally, the Queens Botanical Garden, whose 2002 Master Plan envisions a brook flowing through the garden, nearly on the same course as Kissena Creek. You interest the in the natural environment is enlightening. Please keep sharing. Thank you. I wish more folks would leave comments. I appreciate feedback. 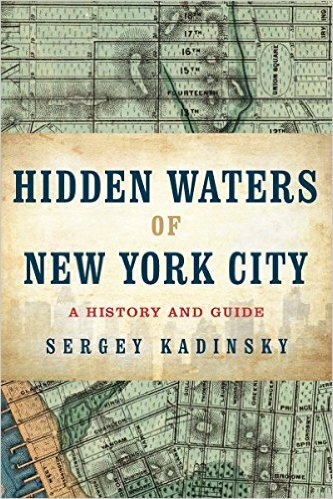 Mr. Kadinsky – This is a wonderful history of a not-too-widely known area of New York City. I graduated from Bronx Science in 1977 and I well recall breaking into the reservoir with numerous friends on a hot spring day to go swimming in 1975!!! Also there was another major complete drainage of the reservoir in the late ’70s for maintenance that lasted several years. Thank you again! Which reservoir are you writing about? The one across from your high school?